Mr. Mcintosh was formerly Za- pata's vice president-corporate de- velopment. Prior to joining the company early in 1973, he was associated with Tenneco Oil Com- pany for eight years in various foreign and domestic operational and planning capacities, most re- cently as manager of supply and distribution for refined products. UGC Instruments, Shreveport, La., as a design and development engi- neer. A native of Shreveport, Mr. Mc- intosh holds a bachelor of science degree in mechanical engineering from Rice University and a master of business administration degree from Stanford University. Zapata Corporation (NYSE) pro- vides diversified natural resource services and products around the world. Its offshore operations pres- ently involve 14 drilling rigs and 41 marine service vessels, which are contracted to international oil com- panies. Five more drilling rigs and 13 marine service vessels are cur- rently under construction. 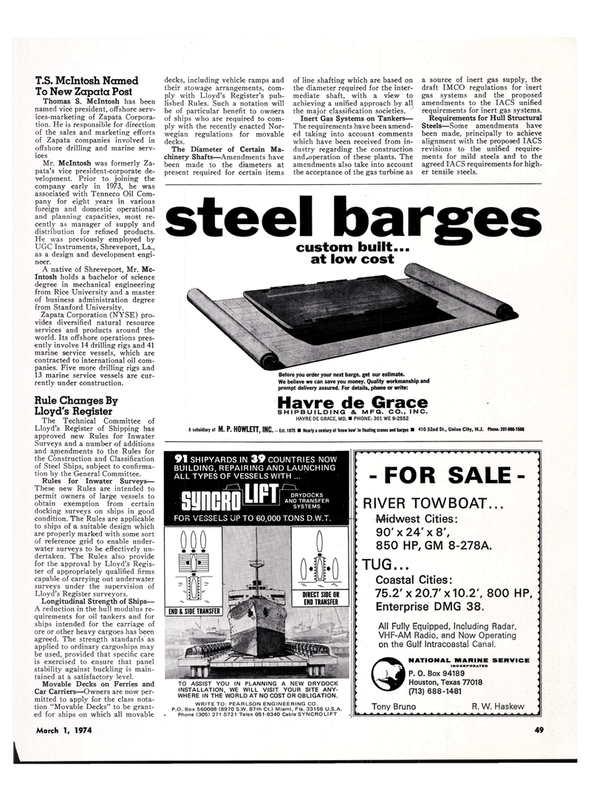 Surveys and a number of additions and amendments to the Rules for the Construction and Classification of Steel Ships, subject to confirma- tion by the General Committee. A reduction in the hull modulus re- quirements for oil tankers and for ships intended for the carriage of ore or other heavy cargoes has been agreed. The strength standards as applied to ordinary cargoships may be used, provided that specific care is exercised to ensure that panel stability against buckling is main- tained at a satisfactory level. Car Carriers—Owners are now per- mitted to apply for the class nota- tion "Movable Decks" to be grant- ed for ships on which all movable decks, including vehicle ramps and their stowage arrangements, com- ply with Lloyd's Register's pub- lished Rules. Such a notation will be of particular benefit to owners of ships who are required to com- ply with the recently enacted Nor- wegian regulations for movable decks. The Diameter of Certain Ma- chinery Shafts—Amendments have been made to the diameters at present required for certain items of line shafting which are based on the diameter required for the inter- mediate shaft, with a view to achieving a unified approach by all the major classification societies. The requirements have been amend- ed taking into account comments which have been received from in- dustry regarding the construction and,operation of these plants. The amendments also take into account the acceptance of the gas turbine as a source of inert gas supply, the draft IMCO regulations for inert gas systems and the proposed amendments to the IACS unified requirements for inert gas systems. Steels—Some amendments have been made, principally to achieve alignment with the proposed IACS revisions to the unified require- ments for mild steels and to the agreed IACS requirements for high- er tensile steels. SHIPBUILDING &. MFG. CO., INC.
Before you order your next barge, get our estimate. FOR VESSELS UP TO 60,000 TONS D.W.T. WHERE IN THE WORLD AT NO COST OR OBLIGATION. WRITE TO: PEARLSON ENGINEERING CO.
P.O. Box 560008 (8970 S.W. 87th Ct.) Miami, Fla. 33156 U.S.A.
Midwest Cities: 90' x 24' x 8', 850 HP, GM 8-278A. VHF-AM Radio, and Now Operating on the Gulf Intracoastal Canal.